J. At Your Service: J. gets spoiled! If you know me, you know that I am a minimalist. When it comes to myself, I don't buy tons of clothes, I own like 2 pairs of jeans. I LOVE shoes but I never buy myself shoes, so I have maybe like 4 pairs. Even when it comes to my passion of party planning, I usually buy what I need when I need it. 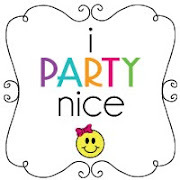 And as of recently, I have wanted to start building up my party supplies but of course I will NOT go out and buy everything I want all at once. It will definitely be a little bit at a time. And if you know me, you know it's because I'd rather buy my children everything else! My children on the other hand, have MORE than they need and may be a little spoiled. Oh well! This Christmas though, things definitely went a little different, thanks to my husband, who is truly the MOST generous person I've ever met! He always tells me to go out and buy whatever I want, but for some DUMB reason, I don't. Well, he knocked my off my socks this past week! He surprised me with something I've been wanting since earlier this year, when I started by obsession with cupcake toppers. Not to mention I love the paper crafting part of party planning! Check it out! I nearly died when this package arrived at my door! I have been eyeing this Chrome dessert stand at Target, since all the Christmas decor came out, which was right around Thanksgiving. I waited, knowing that if would be on sale and the day after Christmas, I bought this bad boy for $15.00, org. price $30. Holla!! I've been wanting this Crock Pot Trio for sooo long. We entertain so much, I just new this would be a great item to have. I actually got to see it put to use at a friends house and it just sold me even more. My BFPV has been on watch for a few months, checking to see when it became on sale and last week I got the text from her. It was on SALE for $49 at Target, original price $89.99 and even $99, in some places. So I ran out the door and grabbed the LAST one! The Craft table I've been wanting? Oh yeah! The day after Christmas World Market had their furniture 50% off. And as I mentioned that lil tid bit to hubby, he told me go out and get it! Isn't he just the BEST!?! But NOW, I really have to get my garage in order! Once the weather permits, we've planned on cleaning out the garage and definitely have a yard sale. I have to say.....J. got spoiled this year! wow! you certainly did get spoiled *he*he....and super cool, you got the cricut! i've been wanting one too, ever since I saw it on Adriana's blog. You will have to post some projects too! @ Claudia- Thanks girly! I definitely will! I have to finish cleaning my garage first :( Hubby can be pretty awesome but don't tell him I said that, or he'll get a big head! LOL! Cricut? Is that the damn thing you wanted for your bday that I didnt get you?? Haha. Remember when I thought it was a kitchen appliance?! LOL!!! @Sister- YES, it is!! That was funny, I remember that! Dork.